Professional Quality Cutlery From Wenger. This professional quality utility knife is larger than a standard paring knife, and features a semi-flexible blade with a tapered tip. This allows for increased precision while cutting, and more intricate knife work overall. The Swibo Utility Knife is a great multipurpose knife to have around for a all sorts of cutting jobs in your kitchen. It can slice through tomatoes like butter, enables you to create perfect looking slices, and is great for any general cutting task like chopping, peeling, slicing or even to carve smaller cuts of meat. The serrated edge of the super sharp blade allows for quick and easy cutting, which enables you to improve the look of your food, and decrease the amount of time you spend preparing it. The bright yellow handle lets you know right away that its a Swibo, but also adds convenience and safety when the knife is in a drawer for storage or the sink for washing. Another notable safety feature is built right into the blade. The back edge of it has a rounded ridge rather than the standard squared, to reduce the risk of injury in case of accidental slippage. The Swibo Utility Knife offers amazing quality, and incredible precision to anyone. 5.25" blade. The Swibo line of cutlery was originally designed for use by professional cooks and butchers, but now this same quality is available to the home chef too. Enjoy the speed and accuracy that cutting with a high quality knife will allow you. These utility knives are manufactured in Switzerland using superior, custom blended steel that is exclusive to this brand. The steel is double tempered for strength, and then stamped to form the blade. The end result is a razor sharp blade with a Rockwell hardness rating of 55-58 that is resistant to the corrosion and wear brought on by excessive use and multiple washings. Even though the blade on this knife is incredibly durable, it also remains slightly flexible which makes it very easy to use. The ergonomically designed handle is comfortable to grip, and features a non-slip texture for safety and ease-of-use. This knife is comfortable to handle so your hand will not fatigue, even after long sessions of slicing or chopping. Each handle is made from a special Swiss designed polyamide that is injection molded and hermetically sealed to the blade. This process eliminates gapping between the blade and handle, provides a hygienic solution, and ensures that the handle remains permanently attached to the blade. Extra attention to detail and better materials make the Swibo line of knives stand apart from the rest. When you use a Wenger Swibo to prepare food you know you are using a high quality knife that will cut great, look incredible, and last for many years. From the makers of the original swiss army knife comes a professional line of cutlery. A half a century ago, Wenger created the Swibo® brand, to be used by professional chefs and butchers. Since that time, the Swibo line has been consistently perfected and expanded to become the industry standard that it is today. These knives are comfortable to handle for long stretches of food preparation and are incredibly hygienic. The one piece handles do not have any micro cracks or pores, so there is virtually no ability for it to harbor bacteria. The polished, high-carbon, stain-resistant blades are stamped rather than forged, which makes them more affordable, yet still extremely sharp and highly precise. The Swibo line of knives is preferred by professionals because they offer a great value. Years of use have proven that a Swibo Utility Knife will outperform similar versions, and will stay sharp and last for many years to come. They are dishwasher safe and can be sterilized if desired. Order Yours Today! 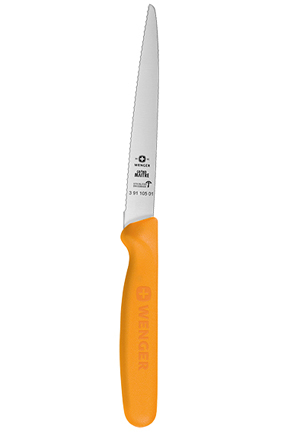 Overall Dimensions 9.75" x .8"
Bade Dimensions 5.25" x .75"
Swibo Utility Knife by Wenger - High quality materials and superior craftsmanship make this Swiss made kitchen gadget a must have. A great accessory for anyone that enjoys cooking. Sharp, Versatile and Powerful. The Razor Sharp Blade Never Needs Sharpening. Infuse Flavor In An Instant! No More Waiting. Same Great Taste. A Powerful Tool Made In Switzerland. Grate Or Slice Hard Cheeses And Chocolates. A Reusable Sheet That Nothing Sticks To. Improve Air Flow, And Allow Fat To Drip Down. Easy-To-Clean And Reusable. Cut To Any Size. Never Scrub Your Oven Again! Slice and serve with the same tool. Cut with uniform thickness and remove the rind at the same time! Extra durable and long-lasting. Preserve food and beverages, or treat sports injuries with these highly efficient hot and cold packs.